Our four rhubarb plants are ripe and ready. I can’t keep up. I have this problem every year. 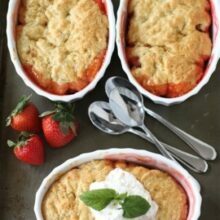 I’ve already made Apple Rhubarb Bread and Strawberry Rhubarb Cobbler, two of my favorite rhubarb recipes. I also made Strawberry Rhubarb Baked French Toast for breakfast and it was magically delicious. 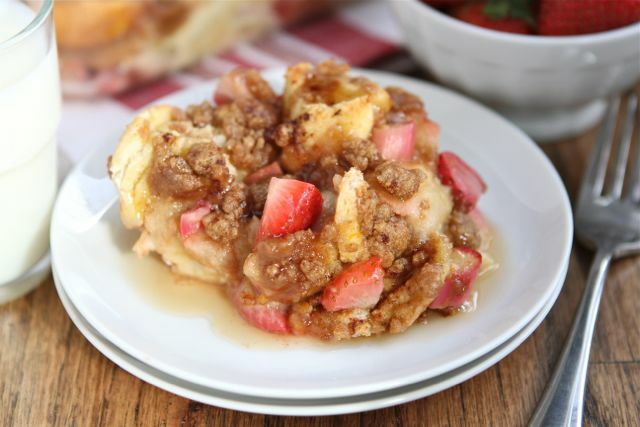 Splurge this weekend and make this Strawberry Rhubarb Baked French Toast. Mother’s Day is on Sunday and this would be a great addition to your Mother’s Day brunch menu. Easy baked French toast with fresh strawberries and rhubarb. Make it the night before serving and pop it in the oven for a decadent breakfast treat. Spray a 9 x 13-inch baking pan with cooking spray. Tear French bread into chunks, or cut into cubes, and evenly place in the pan. In a large bowl, mix together eggs and milk. In a small bowl, combine sugar and orange zest. Rub together with your fingers until fragrant. Add sugar mixture to the eggs and milk. Add in vanilla extract and cinnamon. Stir until combined. Pour evenly over bread. Combine strawberries and rhubarb together in a medium bowl. Pour evenly over French toast. Take a spoon and poke the strawberries and rhubarb down into the bread. Cover the pan with saran wrap and store in the refrigerator for several hours or overnight. In a separate bowl, mix together flour, brown sugar, cinnamon, and salt. Add butter pieces and cut into the dry mixture using a fork or your hands. Combine until the mixture resembles sand with a few pea sized chunks. Cover and store mixture in the refrigerator. When you’re ready to bake the French toast, preheat oven to 350 degrees F. Remove French toast from refrigerator and sprinkle crumb mixture over the top. Bake for 45-55 minutes, or until the French toast is set and golden brown. This is such an amazing spring french toast! Oh my, this might need to get added onto my menu for Sunday! Congrats on getting on Amazon!! I want breakfast to look like this in my house!! I like this recipe! I bet it’s kept just sweet enough with the citrus, the strawberry’s to balance the rhubarb. Brilliant. I just wish someone would make it for me! I have never had baked french toast but it sounds amazing! Looks wonderful, I love the use of fresh seasonal rhubarb! This looks great! My husband isn’t a rhubarb fan, but I LOVE it. Congrats on your Kindle addition! Gracious, we’re on the same wave length with our french toast today. Isn’t it the best? I love the addition of rhubarb to this. YUM! Happy first Mother’s Day to you, Maria. I know it will be extra sweet! Yaaaaay! So excited about your book. I have a copy already so I don’t need another one, but hopefully everyone gets out there and gets a copy! Also, LOVE this french toast. It’s so unique! Love new ways to enjoy french toast! I’ve been anxiously awaiting rhubarb season and thank goodness it’s here! This french toast recipe looks absolutely scrumptious! Your French Toast looks absolutely amazingly delicious! Happy Friday…and Happy 1st Mother’s Day, too!! Oh yummy! It looks amazing!! I love french toast!!! Yum!!! My family aren’t huge strawberry fans (gasp! I know…) but I can’t wait to try it with some other seasonal fruits! I honestly have never tried rhubarb before, but this looks fantastic! What a delicious was to start your day! Strawberry and Rhubarb are so good together – what a great breakfast! Bet your house smelled wonderful after this was done baking! What a lovely treat! So comforting and wonderfull seasonal. This sounds like the perfect Mother’s Day breakfast/lunch/dinner to me! I didn’t know French toast was bakable until recently and this discovery excited me to pieces. My motto is everything is better baked (well….unless it can be grilled…let me know if you ever grill french toast 😉 Your recipe looks so tasty and I know my mom would love it! Thanks for the excellent idea! a very special treat for amazing mothers! how exciting is that to have a copy of this in Kindle! for 99 cents, can’t beat that indeed! This looks delicious – perfect use for my rhubarb patch! Just purchased your book on my kindle, it looks beautiful! Congratulations on an amazing job, I can’t wait to get baking. 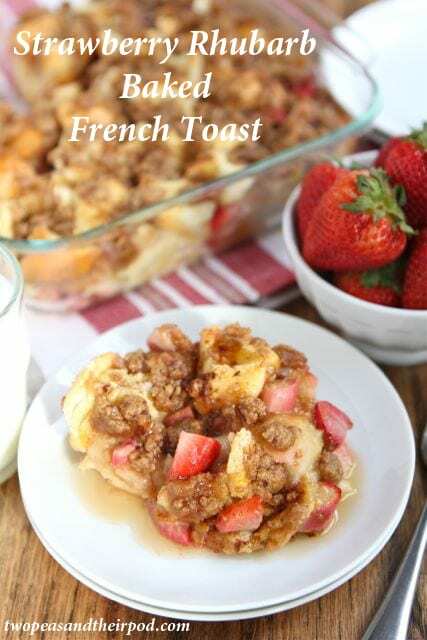 What a lovely French toast bake for Mother’s Day! Great recipe, Maria. Wishing you a very happy first Mother’s Day! Happy Mother’s Day, Maria! I hope someone make this for you, or something else that your little heart desires on your special day! If I had only waited, I could have saved myself a bunch of money on your cookbook by getting the Kindle version, which is how my iPad version is displayed anyways. Seems unfair…. 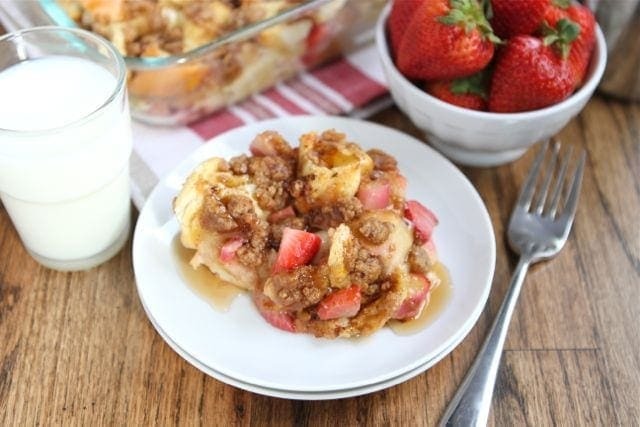 Would love this for mothers day, and I always appreciate a make ahead breakfast! This would be so perfect for Mother’s Day! I love baked french toast. Happy Mother’s Day to you! Maria, this French Toast looks like the ultimate Mother’s Day treat!! Baked French Toast is definitely the way to go for Mom’s breakfast. And I love your addition of strawberries and rhubarb! Yum! Who wouldn’t want Strawberry Rhubarb for breakfast! Sounds delicious! I am so planting rhubarb plants this fall. I love all the spring recipes. I think the tart rhubarb would be awesome with the sweet french toast. Nice work!! Love rhubarb! This sounds pretty darn amazing, Maria! Can I swing by and steal some rhubarb? I’ve never made anything with it and this looks sooo good. You won’t miss it will you 🙂 Have a safe trip home. Yummy! I love when rhubarb comes into season and I try to make as much as I can with it. This looks like a fun, new recipe. 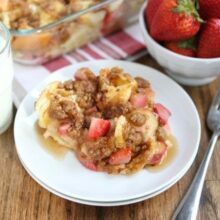 Love the classic strawberry/rhubarb combo + the baked french toast twist! Brilliant. Love the sweet and tart mix here. Yum! I just love how easy baked french toast is to make. Thanks for posting this recipe. This looks sooo good! Nicely done!! I adore baked French toast!! Although I’ve never had it with rhubarb!! Yum yum! This is just what I was looking for for mother’s day breakfast to use up the last of my strawberries. Thanks for posting!! oh this looks so goood!! 😀 i recently made a strawberry rhubarb crumble & had rhubarb for the first time. ♥ loved it! so this sounds amazing! I need to make this! I love the combination of strawberry and rhubard! I’d love to have this as breakfast tomorrow morning! Such a delicious treat for Mother’s day! I’ve never touched rhubarb but Heidi over at 101cookbooks had a recipe for a rhubarb syrup that sounded divine. I am a huge fan of anything rhubarb. This one sounds delicious. love this! Happy Mothers day girl! What a breakfast! 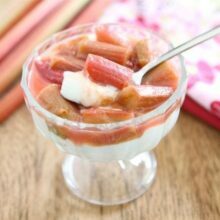 I hope rhubarb stops being so elusive around here so I can whip this up! Dessert-y things for breakfast. What could be better?? Congrats on being on Amazon, how exciting! And what a delicious French toast – yum! Happy Mother’s Day! This french toast would make the perfect brunch 🙂 PS: I love that you grow your own rhubarb! I just bought Cookie Cravings on Kindle! I’ve been dying to buy it and $.99 is ah.maze.zing. Now I think I have to start my own Julie-Julie type project with your book. I want to try them all. Happy Baking! Enjoy those cookies! This looks so yummy. Strawberry Rhubarb is my favorite pie combo, why not have it for breakfast! this was delicious! i even stole rhubarb from my neighbor to make it. i used leftover brioche bread (had been frozen for a few months) that was pretty dry, but it absorbed the liquid so it wasn’t all soggy (like some bakes i’ve had). i halved the recipe and made it in a 8×8″ pan since it was only intended to serve 3 people. although i had about half of it left over! it reheated ok, although the streusel is never the same after microwaving. I remember waking up as a kid to a house filled with that French Toast smell. Lovely! Thanks for sharing and can’t wait to try this delicious version! We made this for our Mother’s Day breakfast yesterday and everyone loved it – thanks for the recipe! We loved that you can do most of the work the night before too, makes everything so much more relaxing in the morning. It reminded us more of bread pudding than french toast, so we almost could have had it for dessert instead! 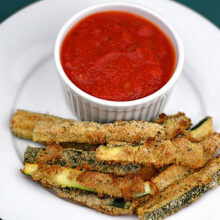 Hi Natalie-so glad you enjoyed the recipe! I will fix the typo:) Thanks!